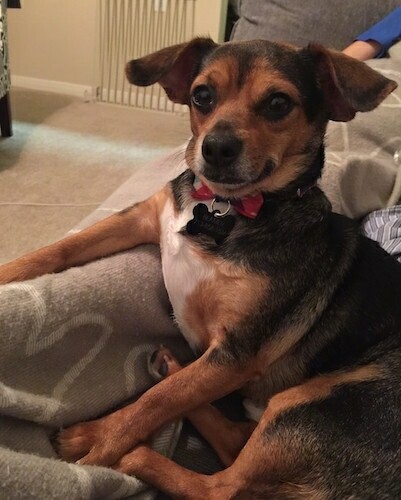 Ace the Chihuahua, Rat Terrier mix at 1 year and 9 months old—"Ace was a big surprise gift from my best friend. He loves to play with his toys and tennis balls. His personality is very strong and extremely demanding when it comes to anything he wants. He is very loving to me and my closest friends. In public, he acts very arrogant and will not allow anyone to pet him. I take him everywhere with me and he's the love of my life...:)"
The Rat-Cha is not a purebred dog. It is a cross between the Chihuahua and the Rat Terrier. The best way to determine the temperament of a mixed breed is to look up all breeds in the cross and know you can get any combination of any of the characteristics found in either breed. Not all of these designer hybrid dogs being bred are 50% purebred to 50% purebred. It is very common for breeders to breed multi-generation crosses. 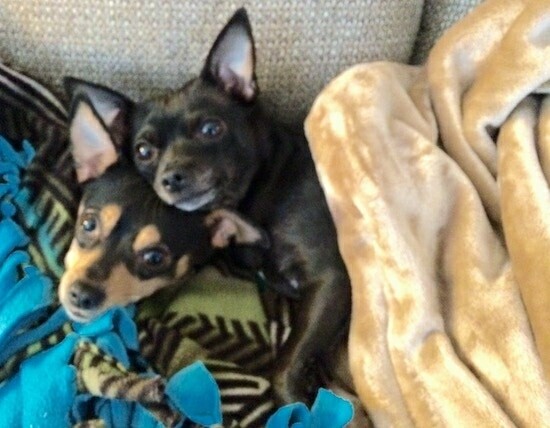 "Sofie and Coco are 7-year-old sisters who are always together. They have opposite personalities. 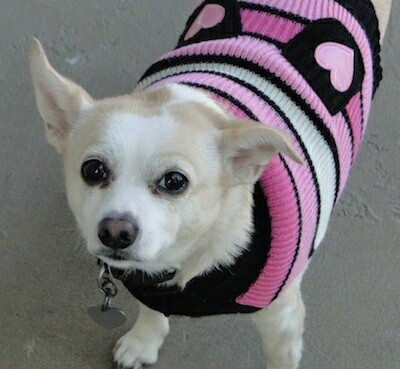 Coco is full of energy & only barks when she hears a noise at the door or other dogs barking. 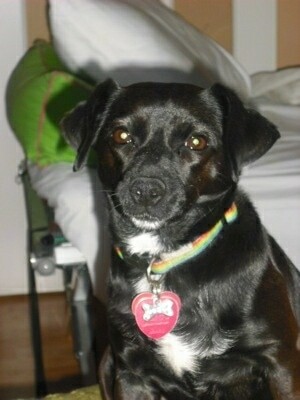 Sofie is more laid back & barks quietly as a back up to Coco. Sofie is a tripod born missing a front leg, but she plays & runs everyday with her sister keeping up & taking a break when she tires out. They love everyone & love to snuggle. They are trains to use potty pads during the snowy winter days. Best pets ever." 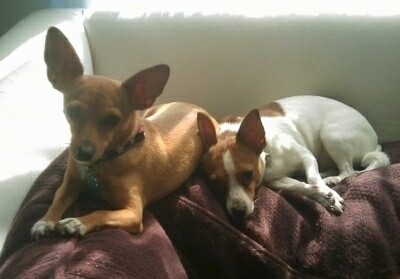 "Rat-Chas (Chihuahua / Rat Terrier mixes)—this is Peanut and J.P.; Peanut is 6 years old and J.P. is 2. They both have completely different personalities for being the same hybrid! Peanut is really lazy! Her entire life consists of nothing more than sleeping and sitting on my lap. J.P. is full of energy! He would run around all day long if he could. They are both great dogs and so far I have had no issues with them whatsoever!" 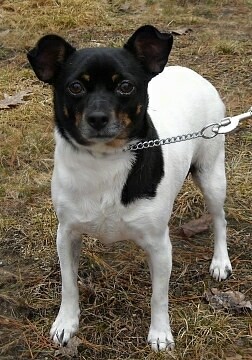 "This is Beamer, a Rat Terrier/Chihuahua mix. He is about 5 years old and was brought into our home from the animal shelter. He loves human interaction and has to be in the middle of the action. Being that he is from the shelter, we are unclear about his history, but he do know he is not very good with small children and other dogs, especially males that are larger than him. We gets walked 2-3 times a day and eats dry dog food." "This is my sweet baby Rilo, and I couldn't be happier with her. She's 9 months old in this picture, and has a great amount of energy. She loves digging into the blankets at night and then stretching completely out. She loves playing with other dogs, but she has to sniff them out first. Before she gets comfortable, she will just keep her distance. So far, she hasn't been a big fan of big dogs. "I was working 13-hour days and planning my wedding this past semester, and her loving nature and the fact that she would get so happy when I would come home that her whole body wiggled was enough to keep me sane. Her only bad habit is that if she hears a doorbell or something similar on TV, she'll start barking. She goes on nightly walks as exercise." "Cesar Millan is one of the few people on TV that is actually real these days. I absolutely love his show and have applied many things with my own pets. Just yesterday our new dog was being naughty and I put him in submissive mode and just walked away. He has not done that behavior since. Rilo didn't need much coaching; she wanted to do anything and everything to please me, so a simple no would work there. I do put myself in a calm, assertive mode when dealing with my pets, and they listen to me, so his philosophies are working, even for someone not trained." "This is my Rat-Cha mix, Patches. She is about 6 years old, and is a rescue. She has the sweetest disposition, and is the constant loving companion of my 7-year-old autistic son. He may rarely speak to anyone else, but he quietly talks to her all the time. She loves to play and snuggle. She is a true joy to be around, and I would adopt another one any day." 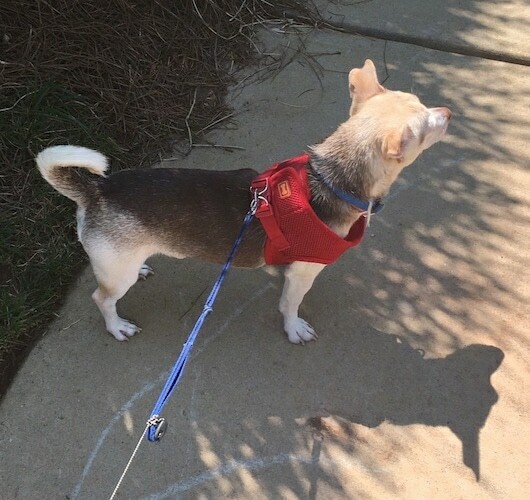 Noodle the Rat-Cha (Chihuahua / Rat Terrier mix) at 1 year old—"He is full of personality and loves to make up his own games! He sits at the top of our stairs and nudges a ball off the top step with his nose, then tries to get to the bottom step before the ball does! Although he loves to play, he is more of snuggler! He will curl in a tiny ball in my lap and fall right to sleep. If you try to move him, his whole body goes limp like a wet noodle! He is a blessing to our family and we can't wait to come home from work to him!" Squeakers the Ratchi at 4 years old—"This is my best buddy squeakers. People love him, but he must be with me. He demands attention and is quick to bark at any noise at all. He is not good with strangers unless I tell him be good, then he will warm up to whomever it is immediately and love them to no end!! He loves to run, and will come to my voice only. 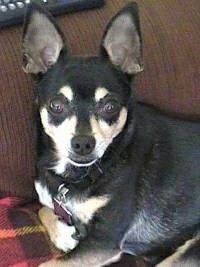 Very loving and full of personality"
"Doc, a Rat Terrier / Chihuahua mix was rescued when she was four years old. I've had her for several months now, and I could not imagine a more perfect dog. She is very sweet-tempered, loves to cuddle and follows me everywhere. She is very active and strong, nevertheless, and loves her daily walk, which is usually an hour-and-a-half stroll in the neighborhood. She is solidly built with a wide stance, a deep and broad chest; she is ten inches high at the shoulder and weighs fourteen pounds. "Passers-by often comment on what an attractive dog Doc is. I live near three public schools, and children often call out, "I like your dog!" "Doc walks nicely on a leash, but I have not taught her any commands. I taught her the "Sit" command in a few minutes, actually, but have not reinforced it very much. Doc is so well behaved and so intelligent that she just sits automatically when it seems appropriate. She has learned, however, to always let me go through a door first. I bought a small ball, hoping that she would enjoy chasing it in our fenced yard, but she has no interest in retrieving or in holding the ball in her mouth. I have not made it an issue. Doc does love water, however, and happily swims. She and Kitty often sleep in close proximity. They ignore each other. I would not call them "friends." On rare occasions, when I leave them alone in the house, I always kennel Doc. "Doc is usually very quiet, but she will bark in response to the bark of a neighbor's dog or to any intrusion on our property. She is an excellent watchdog, but she is not yappy. If I am walking her on a leash and dogs bark at her from fenced yards, she just ignores them in rather regal fashion: walking with me is far more important than responding to another dog! If she sees a squirrel, however, her hunting instinct is aroused and she will sometimes—not always—tug at her leash for a moment. But then she settles down quickly to whatever pace I have chosen and ignores the squirrel, too. "I made a week-long road trip, and Doc travelled very well in her kennel. I stopped at rest areas every two or three hours to give her exercise". "We just got my dog Jack two weeks ago. 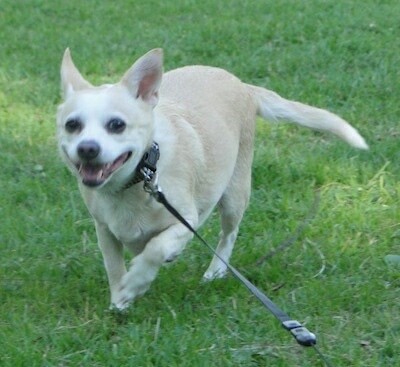 He is a 4-year-old Rat Terrier / Chihuahua mix. We got him in New Hampshire at the Humane Society and they gave us this picture to keep. Jack has a really good personality. He loves to snuggle just as much as he likes to play. His favorite thing is his green tennis ball (which barely fits in his mouth!). He loves carrying his toys around everywhere he goes. He is the best dog we've ever had (and the first). Jack brings joy to everyone he meets." Daughtry the Rat-Cha at 6 months old and 6 pounds—"She loves to jump super high, loves kisses, and is the perfect lap dog! 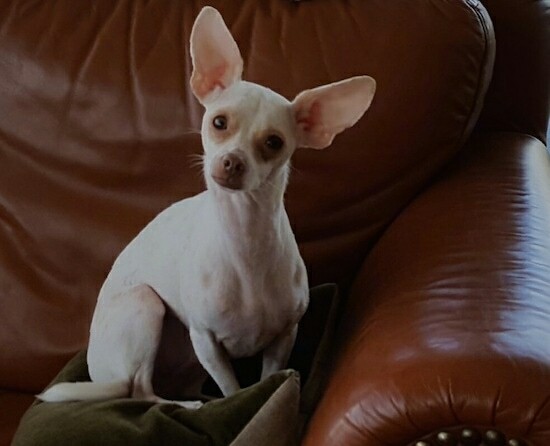 She loves other Chihuahuas and little dogs. She runs from big ones, though. She was easy to train and the sweetest dog ever! Her mom is 100% Chihuahua and her dad is 100% Rat Terrier." 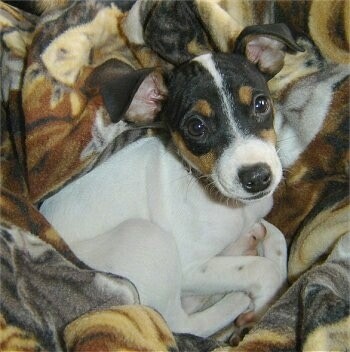 Mijo the Rat-Chi at 3 months old (Rat Terrier / Chihuahua hybrid)—"He was a Valentine’s Day gift from my hubby. He is the sweetest little guy. His best friend is our orange tom cat kitten, but there's nothing better than curling up in mommy's lap and getting spoiled." Abigail Rose the Rat-Cha hybrid at 6 months old—"She is very well behaved. She sits, plays fetch and lies down all on command, oh and she is also housetrained. She loves attention and would do anything to be with her daddy (me) LOL. She has been very easy to train. It has only taken about 1 month to do all 3 things." Daphne the Rat-Cha puppy at 12 weeks old—"She is very sweet and loving, but hyper and rambunctious, too." 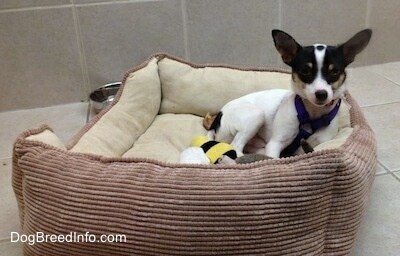 Bud, a mix between Chihuahua and Rat Terrier (Rat-Cha hybrid), at around 1½years old weighs around 15 pounds. 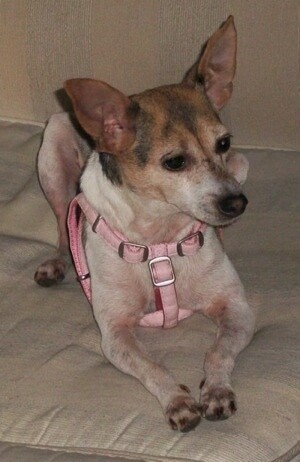 Chihuahua / Rat Terrier mix (Rat-Cha)—her owner says,"She passed away July 2005 at 13 years of age. Her average weight was 9-1/2 lbs., litter-boxed trained, very quiet, and a wonderful companion." Pretty little girl Lula Belle the Rat-Cha at 15 months old—her owner says, "She's quite active, but is just as content napping on my lap. She rarely barks and only does so when she's really excited while we're playing. She has learned fairly quickly to use her Wee-Wee Pad. I reward her with a liver treat each time she poos. At 15 weeks, she's about 5-6 pounds. She loves to sleep under my legs while I'm watching television or on my computer. She's a joy and a terror at times, but I would not trade her for the world." Barkley, a 4-month-old Rat-Cha with Cy, his cat friend—Barkley is a mix between a Chihuahua and a Rat Terrier. Princess Harley the Rat-Cha at 6 years old— "This is Princess Harley. My hubby brought her home to me on the Harley in his pocket when she was 7 weeks old and we have been inseparable since. She is the most loving and animated dog that I've ever had the joy of owning. Devoted to our daughter and very protective of her "pack." 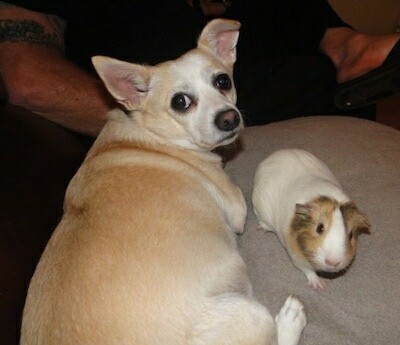 "Funniest thing about this dog is she's best friends with our guinea pig Daisy...kind of a Fox and the Hound kinda relationship LOL."